CHRIS PERFORMS TRUE MIRACLES THAT WILL NOT BE FORGOTTEN. CONTACT HIM TODAY AND SEE FOR YOUR SELF HOW EASY IT IS TO MAKE YOUR NEXT EVENT A HUGE SUCCESS ! is sure to leave your audience WANTING MORE! He has been creating award winning magic for the last 10 years. If you're looking for new and fresh magic to entertain your guests look no further! You can guarantee a clean corporate and family friendly show. Chris is always a true professional. you will also be amazed at how easy going and stress free it is to work with Chris. There is a big list of famous Canadian magicians performing in almost every city of Canada and abroad. Most of them perform locally and only a few accept out-station functions. Here I consider only magicians known around the globe. One of the magicians who really impress the crowd is Chris Christyrious Turchi. He truly stands out among other magicians of his era with his unique style. Chris Christyrious Turchi has been in business for more than 20 years. His achievements in magical entertainment are enormous and incomparable. He has numerous memorable performances to his credit where he surpassed his other colleague magicians. His magical astonishing shows have earned him thousands of satisfied customers. He enjoys warm welcomes from the fans of different races, social classes and age groups all around the world. His shows are popular and his videos are watched over and over again. Be astonished by a pleasantly witty, hilariously humorous, fantastically fast, clean and amazing with his mind blowing magical tricks. He definitely is so idyllic in his great performance that matches so perfectly with his pleasant personality. He has the ability to mesmerize his audience for a long period of time. Christyrious has an unparalleled ability to perform in any gathering or at any occasion of any size or expansion. He will be much enthralling as a wedding magician and will be too hilarious as a comedy magician. As a party magician he will amuse his audience according to their age group and social status. He has something special for each person in the audience. Christyrious is spectacular at trade shows as corporate magician, highlighting the requirements with utmost skill. He has a God gifted skill to enlarge what normally looks tiny. He enjoys people’s astonishment over his magic while performing as close up magician and interacts with people cheerily. People go crazy for him specially kids and young women found so loud at his shows. Almost every Toronto magician has his own brand of items grounded on Illusion, Mind Reading, Card Magic and Daring Escape. The high quality entertaining performances of the Toronto professional magicians are impressive, spellbinding brand of magic and illusion, that be-charms audience of all ages completely. Chris was five years old when he went to the Niagara Falls Houdiniʼs museum. It had Houdini's head as a floating hologram that spoke. As a five year old would be, Chris was fascinated by this amazing thing. As he grew he became intrigued by the museum & started to understand who Houdini (the floating head) was & what he did. Chris became obsessed with Houdini, illusion & escape, dying to know how any of it could be possible. At age 8 his mother introduced him to the world of David Copperfield, it sealed the deal...once he watched the first TV special he knew he would become a magician. He got his first magic set when he was 10 performing card tricks & effects through out high school. At age 19, in Las Vegas, he walked into Houdini"s magic shop & went from mysterious to Christyrious! Starting the journey into the real world of magic. At age 22 in New York City he visited Houdiniʼs grave. 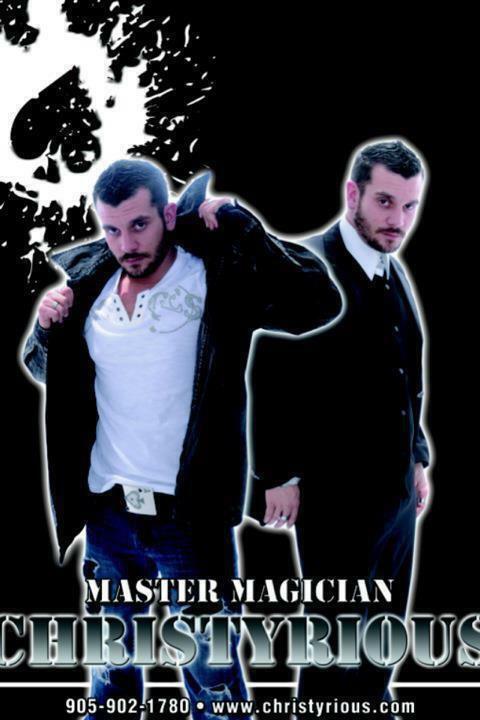 By the age of 25 became the President of the International Brotherhood of Magicians Magic Club. Now magic is his job, his career, his life. Performing for all clientele from kids to celebrities all over the world! If your looking to hire a magician, look no further. Chris Chrityrious Turchi is very accommodating and designs his shows according to your limitations and particular requirements. What a great experience in California teaching my magic to the world..